Growing up, we spent most of our holidays in the very tip-top of Utah at my Grandma’s house. She made delicious meals, personal-sized pies for each grandchild, and the most amazing cheeseball you ever tasted. It was always snowy and wonderful. My grandpa, a retired dairy farmer, also wore a plaid jacket around the house during the cold months, and I especially remember it during our Christmas get-together. 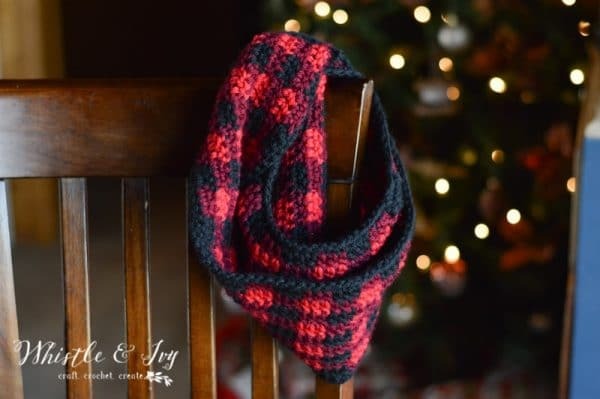 Every time I see red and black checked plaid, it reminds me of those wonderful snowy Christmas’s surrounded by family and my beloved grandparents. 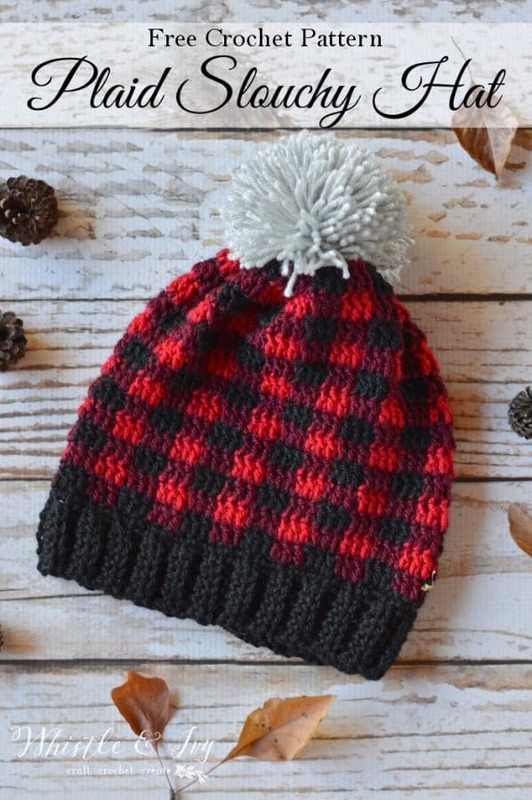 I don’t incorporate a ton of plaid into my wardrobe (I don’t wear a lot of red), but it screams HOLIDAY to me, and I love how this crochet plaid slouchy hat turned out, perfect for this time of year! This hat is almost ALL dc stitches (yay! ), and works up pretty quickly. The color changes can slow you down a bit, but I made this hat in just a couple hours. My first had I put a yarn pom-pom on top which was okay, but when so many people suggested adding a fur pom-pom I decided I must give it a try! Quite a winning combination, I must say. Complete your Plaid collection and get The Plaid Collection Vol. 1 and Vol. 2! Note: You can make the hat band longer to make the hat larger ( or visa versa). When you begin the hat body, make sure your first round is worked in multiples of 6. 1. Continuing where you left off from the band, Ch 1 and sc in same space. Sc all around the top of the band, working 3 sc over a 2 row space, achieving a total of 72 sts. Join with a sl st.
4. – 15. Repeat rows 2 and 3 respectively until you reach 14 total rows. Tie off your yarn and weave in ends. To close the hat, cut a length of yarn longer than the circumference of the hat and thread it through your darning needle. Turn your hat inside-out. Sew a running stitch all around the top of the hat. Once you reach the beginning, pull the thread tight cinching the hat closed. Tie a firm and sturdy knot. Clip ends. Turn hat right-side out. Make and attach a pom-pom using this tutorial. Are you mad about plaid?! Want more crochet plaid awesomeness? Check out these! 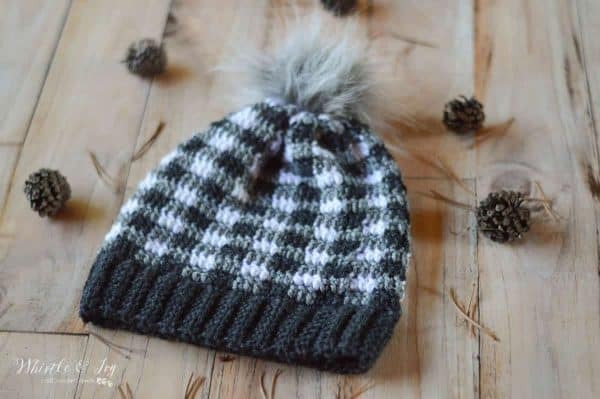 Like this free crochet plaid slouchy hat pattern? Subscribe! I am having trouble with the beginning of the next row. It says ch2. DC in the same stitch. DC in next stitch.where I have trouble in understanding is the next: begin a third dc. So will there be four DC at the beginning of each new row? Or will there be only three like the rest of the row? Absolutely love this hat! It made great Christmas Presents and were a big hit in my family! Wahoo! I am so glad! I’m getting ready to attempt my first buffalo plaid. I’d like to have a band that I can turn up. I was thinking of chaining 14. Your thoughts? Yes! I think that will work perfect! Thanks Kellie! Your kind word are very much appreciated. You can share in our Facebook group, on my facebook page or tag me on Instagram! LOVE the pattern! Alternating colors is so easy! 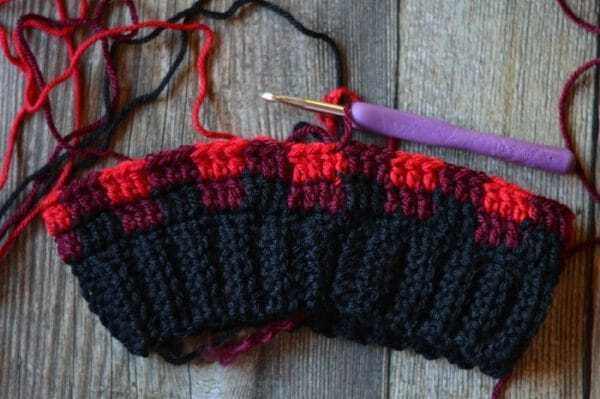 I do just have a quick question… when you finish with the row, do you cut your yarn, or do you just carry it around each row until you reach the end? I was just a little confused on that. Emailed you back with a picture as I can’t figure out how to put a picture in the reply from my iPad. Hmmm, I tried to reply here and for some reason it didn’t appear. I can’t seem to figure out how to paste a picture into this reply box, so I replied to your email with a picture. Hope you found it. Thanks. I have noticed this same thing happening to mine. I have made more than one now and the first hat did not slant. I cannot figure out what I’m doing differently. Carol, I have the same problem. The plaid starts to go diagonal and I cannot figure out why. Did you get any help with this or figure it out yourself? Are you still working in dc? Is it possible you are wrapping the yarn around your dc the other way? I have heard this causes it to slant. I love this hat and would love to make it greens. Any ideas? I’d make it with the black yarn in it too. Thanks! I would maybe do two shades of green and black. The darker green would be your mid, the lighter green would be your light and the black would be your dark. Love love love!! Just finished my first, going to put a fur pom in and start another! I did go a few extra rows at the top tho. Thank you! Yay! So glad you like it! You are welcome! Love your patterns! Made my first plaid last night and it turned out beautiful thanks to your tutorial. Can you tell me how to size this for a infant/toddler? I was wondering if this pattern can be adjusted to make a regular fit crochet hat and not a slouchy hat? 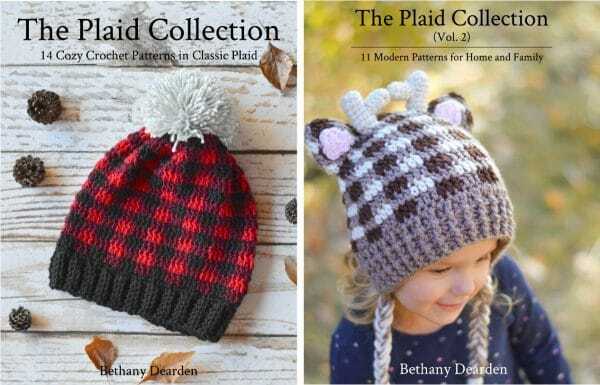 Bethany, thank you for the pattern, I’m looking forward to trying it out. I am such a fan of that pattern, being Canadian and all. That said, please don’t use fur and don’t encourage others to use it either. The brutality that animals suffer so people can decorate is shameful. Don’t take my word for it, check it out for yourself and I’m sure you will agree – there are better ways to make something cute. Did you achieve the gauge? Thank you so much for the pattern. 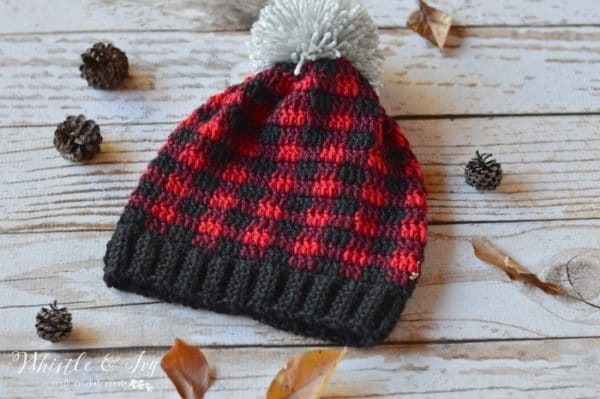 I made the plaid hat with Red Heart Soft. I counted stitches and had gauge correct. My finished had looked great. However it did not fit me but did fit my four year old. What can I do to for my next one so it’s bigger? I really love your plaid week patterns. I plan on making the hat scarf and the arm warmers for a gift and the baby cocoon set. Thank you so very much for sharing. I just wanted to say thank you for the beautiful pattern. I choose to do it in greens, but I love this pattern. Hello, I want to make one of these hats for a man. What would the brim count be? I am going to use the colors black, white and gray. It’s quite stretchy, I wouldn’t change the count (if you are getting the gauge right). Hats stretch out over time, so it’s best to make it small to begin with. What type of yarn are you planning on using? I have had some people struggle with the gauge using a stiff yarn like RHSS or similar yarn. That was my problem it was too big using RHSS. So i had to take it apart and get a different yarn . Then i’m sure it will work. Your band was the easiest pattern to follow,it worked up pretty fast to . The only problem is working with black is hard on my eyes. Thank you for your patterns. This seems to be my problem too. I’m using RHSS and hat seems monstrous! I still have to stretch it to get it on my head, but it’s for a teenage boy and I’m nervous about the size. Do I need to switch yarns? Or just change hooks? Unfortunately, different yarns work up differently. It would be nice if all medium weight yarns were truly the same weight! I have found RHSS to be a bit thicker than other medium weights. If you are worried it’s too small, you can switch hook sizes. A hat for a teen boy should be similar to an adult hat in size. Hmmm, I’m actually worried it’s going to be too big. And the other yarn I have on hand seems thicker than Red Heart. So I just try to go down one hook size and see how that goes. Thanks! It would unfortunately be a bit of trial and error on your part. If there isn’t must stretch then I would make it a bit bigger. Maybe 20-22″ inches. Ashley, what colors are you using? I love Deborah Norville yarn and would prefer to use it. 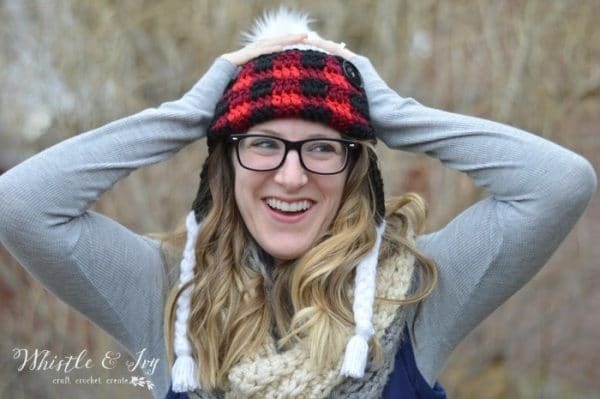 Hi, I have looked all around this Blog for the Bum Hat pattern, and can’t seem to find it. Hm, I don’t think that is my pattern, sorry! 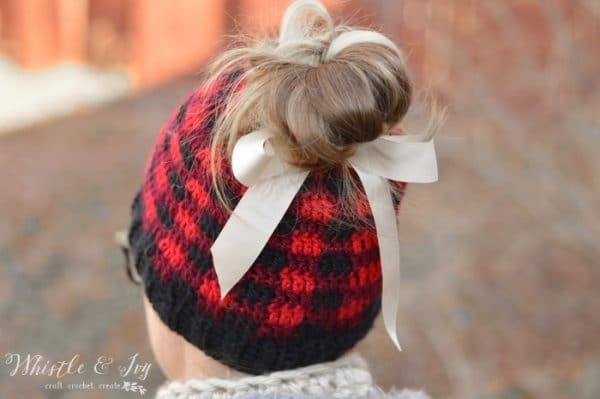 Late reply but just google bun hat free pattern and you’ll find one! Could you make a pattern for matching mittens please? I’ll put it on my list! I will be doing another plaid week in the fall. Thank you! Tag me on Instagram or share on my Whistle and Ivy Page, I would love to see! any chance you have a pattern for a blanket – that looks just like this. but obviously larger? not sure how to do this when not working in the round! Hi, Bethany! I LOVE your pink plaid hat!! Can you list the brand of yarn AND the colors you used for it? Love this pattern!! Super cute and will work up quick! but how come your plaid rows look so straight up and down and mine are slanted a bit?? does that make sense? Thank you! I am not sure why is would slant, dc stitches are usually very straight. Are you working through both loops? Are you working a dc in the same st as the ch, or are you coming the ch as the first st? Love it, really attractive. Pinned! Thanks so much for sharing. I am having trouble with your web site. I have now subscribed to your email, but am still having problems (not responding….) 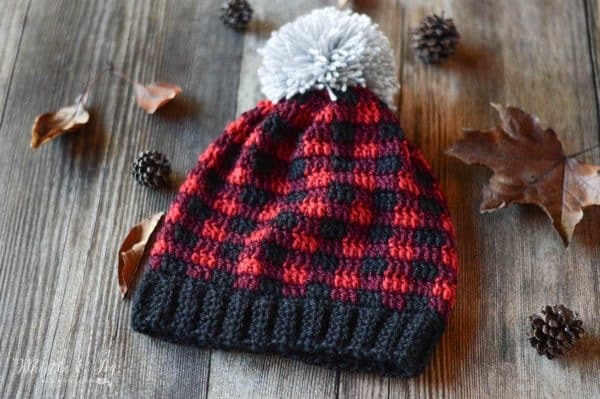 I’d love to have the pattern for the red/black plaid hat and the pink plaid hat. Where can the actual pattern be found without all the pictures? Thank you! The pattern is on this page. It is currently the only version, sorry! Hi. I am making crocheted things to sell at a booth thingy at a fair, can I sell these cute hats? I just love them and I want to sell them. I could give credit to this site if you want. Yes you can! Credit would be much appreciated. 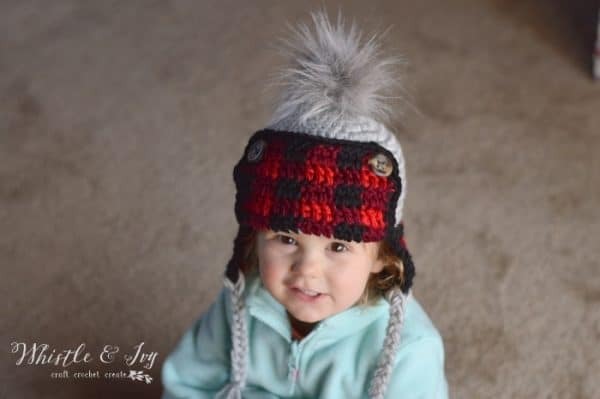 I am making this adorable hat for my daughter in law…….her head measures about 21″ in circumference…. I have completed the band of 46 rows = 15 inches……. just want to make sure it’s in the range of size and will stretch the right amount so it is not too snug, but like you said in an above comment, not to loose to slip off……, it just seems short to me !! haha…….thanks for you help!! wondering where you find your fur pom poms?? Any suggestions on how to keep your yarn from tangling? Mine is a mess!! Love this pattern!! I have a question about carrying the two colors not being used. When I first started, I didn’t pull them tight, and I could see the colors in my stitches. It looked better when I pulled them a little bit, but the result was a very non-stretchy hat! :( What are your thoughts on this? Thank you!! You want it somewhere in between. Pull them SNUG, not tight. If your yarn is rather stiff like RHSS, that makes a difference too. I’ve been thinking I need a new hat and was not sure what to try – thats all been decided now I’ve seen this. I love it – thanks so much, I’ll have to sort though my stash, see if I have everything I need or if I need to pop to the shops! You can continue the same, or you can do 66 around the hat instead. 14 DC =4″ and I still only get 39 rows for 15″. My swatch was bang on so how did you get 46 rows? It could be a number of factors. Are you using the exact yarn that I suggested? I provide the 15″ measurement because so many people think they need inches, and since the band is so stretchy (but doesn’t snap back once stretched), it was the most accurate way I could think of. You can use your own head as a guide if all else fails. 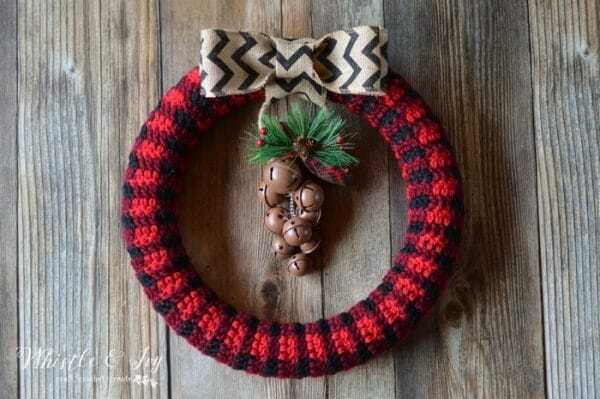 I used I love this Yarn from Hobby Lobby as well as Red Heart yarn. I used black and red from Red Heart and I love this yarn in the color Aubergine. Turned out perfect. I used an I hook and only crochet 40 rows in the band because it measured 17 inches at that point. I still did 72 double crochet in first row after the band was done. Love this project! I didn’t listen to your instructions on 15 inches unstretched for the band, so my hat came out a little more slouchy. Never fear, I’m gearing up to make 5 more, so I’ll follow the directions moving forward. Thanks for sharing this great pattern. Excited to play around with different poms. Thank you! Onward and upward :) Glad you like the pattern! Yes, you can use my messy bun hat as a guide work one more row to close it. How much medium weight yarn. This doesn’t say how many balls I will need to buy of each color. Please advise cause I may be missing it somewhere. Less than one (100 g) ball of each color. Thanks so much for this great pattern and the supporting tutorial video on YouTube. When I hadn’t quite finished it, I sent a photo to my daughter and she has claimed it. My daughter-in-law came over and it matches her coat, so I guess I’ll be making at least one more, a bit smaller. Probably there will be lots of these in my futures because the grandkids have buffalo plaid flannel shirts. Good thing it’s so fun to make. Any thoughts on how to convert this pattern into one of the messy bun hats? Or if it would even be possible? 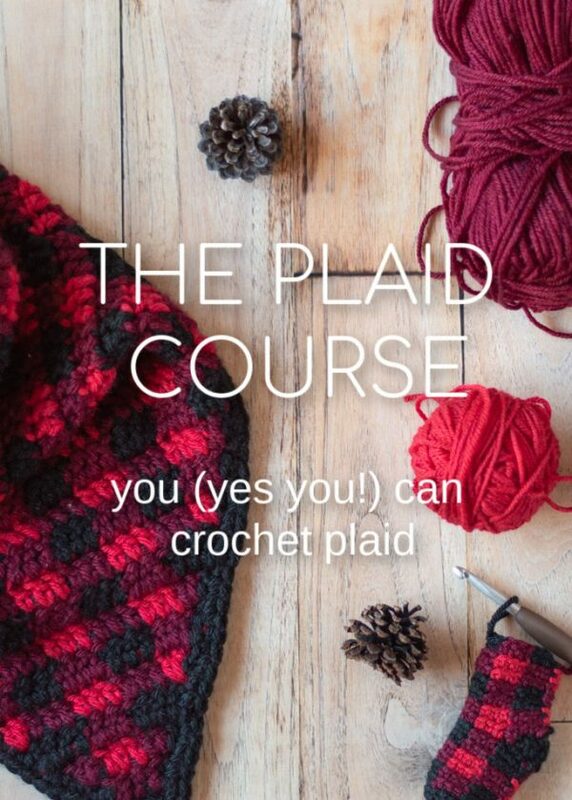 yes, you can work fewer rounds of the plaid stitch and work a few rounds of decreases. 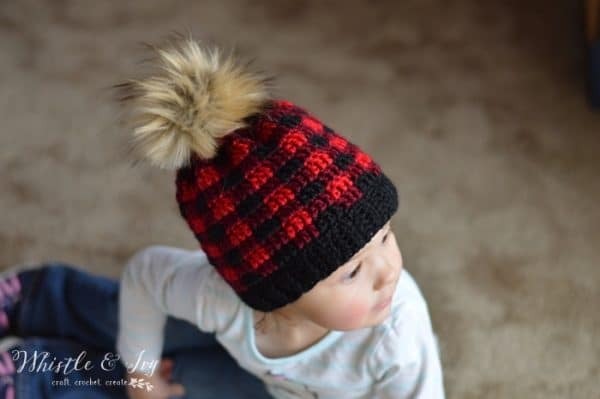 I have a toddler version here, you can maybe make it with a smaller hook, but to make its smaller, work less rows on the band, and make sure the body of the hat is in multiples of 6. I am working on my 2nd one but changed to greys and black on the second. The result on the red ,wine and black is great and the grey is pretty good too. I made a mistake on not doing multiple of 6 and it shows but will wear it to the back . The lesson is pay attention to the instructions! To close the top I chained a strand and wove it through. Mine is slouchy and I really like it. Thank you. What size should this hat fit when completed? Women’s? Yes, women’s (it’s in the title). I love the plaid. It’s so sharp! I only wish I could make it from the top down. Any idea on how I would do that? Thank you for the pattern. You know, I am not sure! Doing the increases while keeping the square check patterns would be a bit tricky, but I will see if I can figure it out. I started to make one,but I a little confused about the band part,from having 46 stitches how can you ended having 72? I made theasy Increase every 6,but still don’t get the 72.do I need to make more increases every how many stitch???? Sorry! It’s a bit hard to explain. It depends on where you are working your stitches. I work doubt 3 sts per 2 rows or hdc. If you work that any stitches and you increase every 6 is should get you there. Try this, and count your stitches when you are halfway around to see if you are on track. Just finished my first hat! It’s beautiful and was so easy to do, using the same colors here. Looks more complicated than it really is. Very nice pattern and great instructions! Now I’m digging through my stash to see other color combinations to use! Hi! I love this hat it is sooo cute! 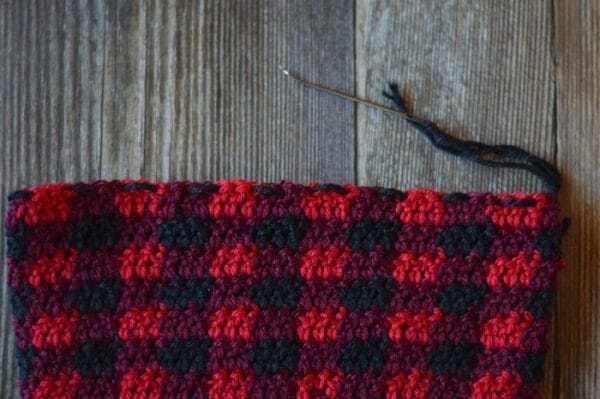 I’m really new to crocheting and want to know what -46 ch. 1 mean. I don’t know what the negative 46 means.. can you help me out? Love this hat!!. Thank you. Is definitely on my To Do List. I wish I could figure out how to make a scarf without the back side looking messy!! Any ideas anyone?? Woo hoo! Looking forward to it. Thank you. I did mine without a pompom it looked cute. just pull it tightly as per her last step. If there is still a hole you can sew it up tight by grabbing a few back loops using a needle and same color yarn. do this with the hat wrong side out of course. I love this! and want to try it. I’m a little confused. When you say “carry it through the next three stitches” do you mean bring the yarn behind your new stitches, or join it into the new stitches? So does the wrong side have some short lengths of yarn that are not worked in? Like loops? 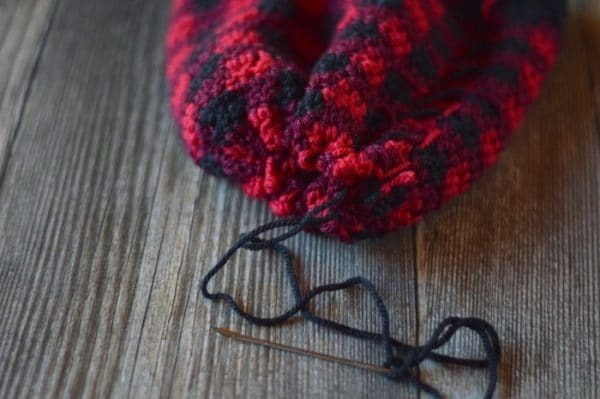 It means to lay your yarn behind your two loops and work it within the stitch so it is hidden. Does that make sense? 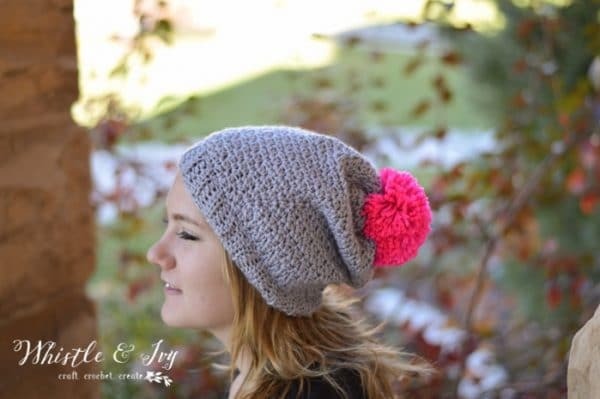 Do you have a knit pattern for a slouch hat?? I don’t really knit, I am sorry! I can do a knit stitch washcloth and that is about it! Hi! If I add 6 to my ribbed brim, how many sc do I have to put for the start of the hat? Thanks! The body of the hat needs to be in multiples of 6. Hi, this might be a silly question but when you slip stitch at the end of the round, does it go into the top of the chain 1 and 2 or into the 1st sc and dc? Thank you! The only way I can think is to do maybe 3 rows without the color casing and work increases. What an adorable pom-pom hat Bethany. I love the mix of colors. Do you sell these? I don’t have one yet,but I am hoping to get it finished next week. Can you just use 2 colors or do you have to have 3? I am using dark purple instead of your black and light purple instead of your wine. I don’t know what to use instead of your red. 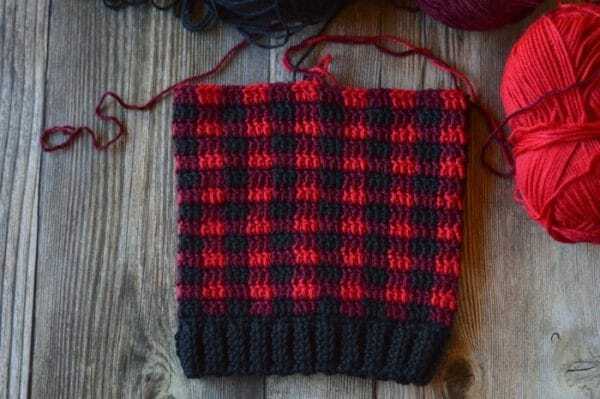 You need three colors to make the plaid pattern. You could use black, dark purple instead of wine, and light purple instead of red? THank you! I picked grey. I looks great. How can we share our finished projects with you? When crocheting this left handed, would I turn the band so the seam is on the outside instead if in? I hope the question makes sense. I’ve just found some stuff work up backwards for us lefties. That depends. When your working left handed, is your stitch facing you or facing away from you? Would you turn the hat inside out when you are finished, or would it be right, side out? The seam should be on the same side as the wrong-side of the stitches. Also,,, do you carry through all 3 colors or only 2 at a time. ?? Only two at a time, I drop the third until I come back around. 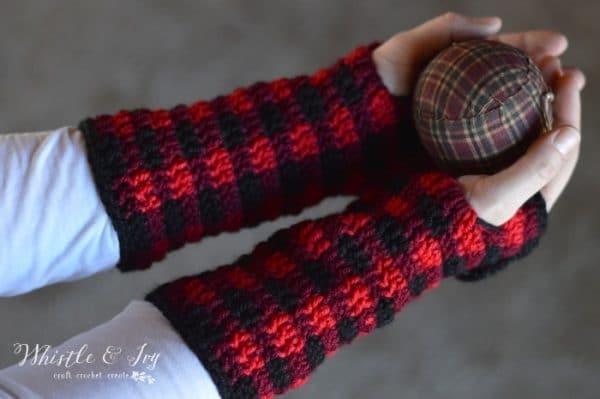 Love this pattern and can’t wait to try it. Thank you so much for sharing it. For those looking to print this pattern and as yet no PDF, what I do is simply screen shot each part and then print the screen shots. Its really very stretchy. As indicated, your band should be 15″ unstretched. The measurement is a bit hard though, because once you “test” it around your head, you have stretched it, so your measurement will be off, it doesn’t immediately spring back to the length it was. I wear mine slouchy though, so I hate when it slides off the back of my head and prefer my hats snug. Really? Hm..The band is not stretchy? What is your gauge? The gauge should be 11 dc is 3″ long. I crochet rather loose, I can only think that maybe you crochet tighter than me and it makes for a denser, less stretchy fabric. I tried to find a print button to print out just the pattern,did i miss it or how do I print it out?I dont want all the stuff on the side of web page in the print out. Sorry, I don’t have a print friendly option! I will have a downloadable ad-free PDF available after the CAL is over. Any chance you have a patter for child sizes too? I will actually be released a toddler and child version next week! If you subscribe to my blog you will get an email notification! Just finished mine in the colors you used and LOVE it! About to start another with 2 shades of pink and a gray! Pattern perfectly written~ easy to read! Thanks so much for sharing. I had to increase th size a bit and you made that easy too! Yay! So glad you like it! You are very welcome! Hello, Thanks for sharing this beautiful pattern, this is whatever i have been looking for. I Will do one for myself and for my 4 years old son. Do you have a pattern smaller sizes? Or do you have any suggestions for making a smaller size of it? Thank you! So glad you like it! I have plans to make them smaller for sure, but you can give it a go by making less rows for the band (not too many head sizing does not very a very huge amount between kids and adults) and doing the hat body in multiples of 6 (you can do multiples of 3 if you are in a pinch, but you might end up with 2 same colors in a row at the seam. Thanks for your kind answer. I Will try it. Thank you so much! Love this pattern and I’ve already started. I do have a question though- to go from the hat band- 46 stitches- to the body and increase to 72 stitches- it seems like you’d have to add an increase more than every 6 stitches? More like every other stitch? It completely depends WHERE you are working your stitches. Since hdc rows are taller than sc sts, I work 3 sts for every 2 rows. Plus the increase every 6 sts. Does that make sense? 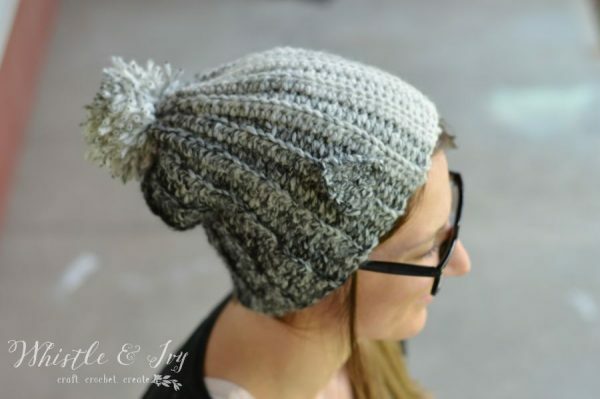 Love this hat and am looking forward to making it asap! 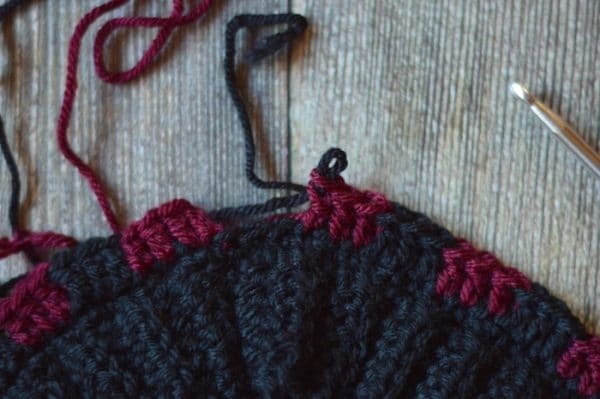 One question: when you say to carry the other color through the 2nd color’s stitches, what does that mean? It means you will lay the yarn behind the stitches, and work them into the stitch so they are hidden. It’s not necessary, but it keeps the inside clean. It’s 4:30 a.m., I’m doing my best to NOT go searching my stash for yarn to start this hat. I can see it in Seahawk colors (blue, green, grey). I absolutely love how you close the top. I now see more bottom up hats in my future. Thank you for a simple & free pattern. Haha! Well I hope you have time later :) Love your color choice! I would love to see it! Yay! Awesome! You are very welcome! How much yarn for each hat and what size hook? Size I (check materials list) and I don’t have exact yardage. Less than 1 half skein of each color. No, but I have plans to. Stay tuned! Does BLO mean back loop only? What size hat does this pattern make if followed as written? Love, love, love this hat!! I will be working on this tonight, after I get my house cleaning done! Thank you for the awesome pattern. Love your patterns! 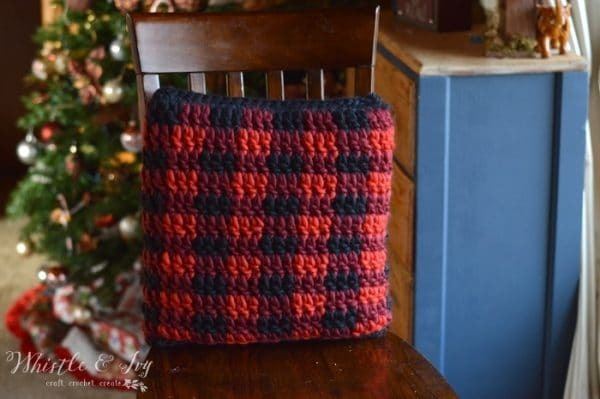 Absolutely love this plaid hat, may have to make a pillow too, thank you!!! Wow! Thank you, this hat is awesome!